Have you ever lost an expensive phone? Hurts, doesn’t it? I’ve experienced it, and it’s only when it happens when you realize you’ve not only lost a costly device that you’ll need to replace with another one soon, but that losing it also means someone might stand to gain access to your photos, emails, bank accounts and so forth. Mobile security software maker TekTrak thinks it has a solid solution for that problem, and the startup has just raised a seed funding round from some notable angels to prove it can turn it into a profitable business, too. Tektrak has developed an iPhone app dubbed TekTrak Pro ($2.99) that allows users to monitor the precise location of their device at all times and secure sensitive or private information stored on the phone. 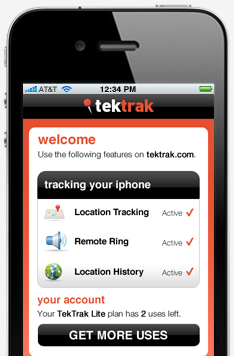 The TekTrak application uses 3 hardware components already built into most smartphones (cellular, GPS, and WiFi) to pinpoint the location of the phone, in the background of iOS. Obviously, this only works when the phone is turned on, but users can always see where the phone was last located (which might help them retrieve it on the spot). Location tracking and history aside, the TekTrak app also comes with a remote ringer feature that gives users the ability to locate their device once they’ve narrowed down its whereabouts and are located in close proximity of the phone. Evidently, this is only useful when sound is turned on. Obviously, TekTrak has tough competition in Apple, which has just made its similar Find my iPhone/iPad application free of charge in the just-released iOS 4.2. TekTrak posits that it also allows users check the last known location and location history of phones, something Apple’s MobileMe does not support. The company also points out TekTrak provides support for the vast majority of iPhone users, including iPhone 3GS devices, and not only iPhone 4. The fresh capital will also allow TekTrak to expand to more mobile operating systems and platforms, starting with Android, and to enhance its existing iPhone application with more features. Investors in the seed round – the size of which remains undisclosed – include Cyan and Scott Banister, Kima Ventures, Sergey Grishin, Wasabi Ventures, BCITL Ventures, Barney Pell and Yoni Saban, among others.